On Saturday I swapped my teaching for adjudicating, spending a day in London at the Musica Nova International Music Academy situated on Cromer Road, near King’s Cross train station. This busy studio is owned (and was founded) by Russian pianist and singer, Evgenia Terentieva. As well as a music academy, providing one-to-one tuition (for children as young as three, right up to adults), the studio holds many courses (on a wide range of musical subjects, from musical theatre, to a ‘music wonderland’ programme) and a yearly competition; Stars of the Albion, Grand Prix. The Stars of the Albion international performing arts festival & competition, now in its fifth year, joins gifted musicians and dancers from across the world. The project forms a unique bridge connecting vibrant cultures and, in particular, those of Russia and Great Britain. It aims to provide valuable opportunities for young emerging artists to perform, learn, communicate and develop. There are many different classes open to competitors, and the event is going from strength to strength with a huge variety of disciplines and participants coming from around the globe to show case their talents. I’ve been fortunate to be on the panel of judges for the past three years, and during this period I have observed the Stars of the Albion morph from a fairly small-scale competition, with one jury hearing all competitors, into a large-scale affair with two competitions (and two juries) running in tandem. 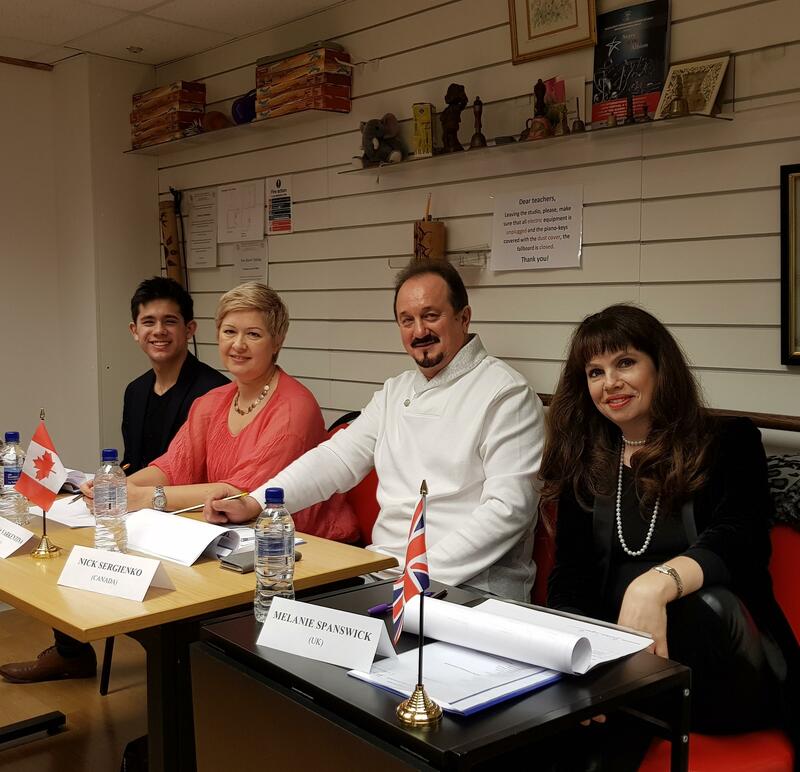 This year I chaired the instrumental panel, working alongside (pictured below from left to right) concert pianist George Harliono (also from the UK), viola player and string teacher, Natalia Varkentin (from Latvia), and pianist and teacher, Nick Sergienko (from Canada). The standard of playing was high, with most instrumentalists playing a well prepared programme (consisting of two contrasting works) from memory. The youngest performer was just six years old but already very accomplished, presenting Sonatina in A minor Op. 94 No. 4 by Albert Biehl and a humorous work (Funny Puppy) by Anne Crosby. Her technical control was impressive with musicianship well beyond her years. One reason I really love adjudicating is the breadth of works and composers offered at this type of competition. When judging festivals, set works frequently govern student (and teacher!) choices; pupils may be gearing up for an exam, so I might hear typical offerings from the ABRSM Grade 7 syllabus. During this competition, however, we listened to a diverse collection of pieces across several instruments (clarinet, violin, piano and balalaika). The balalaika is a regular fixture in predominantly Russian contests such as this (and during my first year adjudicating at this competition, one such player won the Grand Prix award for the most outstanding performer). It’s a popular instrument and this year’s competitor had studied at the Central School in Moscow and was a touring professional (there were student, amateur and professional classes on offer). He was fantastic, and gave us rousing renditions of Vera Gorodovskaya’s Kalinka and Alexander Zigankov’s Introduction and Chardash. I played the clarinet whilst a student, so relished hearing the beautiful Clarinet Sonata Op. 167 by Camille Saint-Saëns, having played it myself. The same participant also offered Igor Stravinsky’s exciting Three Solo Pieces (1919). Other repertoire offerings included: Pyotr Ilyich Tchaikovsky’s Russian Dance for violin, Vittorio Monti’s Czardas (violin), Suite italienne (1932) by Stravinsky (violin), Sonatina in G HWV582 by George Frideric Handel (piano), Chaconne by Tomaso Antonio Vitali (violin), Salut d’amour by Edward Elgar (violin), Take Five by Paul Desmond (violin), Hava Nagila Trad. (violin), Sonatina in C major Op. 55 No. 1 by Friedrich Kuhlau (piano), Romance in F major by Dmitri Shostakovich (piano), Sonatina No. 3 in F major by Thomas Attwood (piano), Ragtime and Fantasy, both by Manfred Schmitz (piano duet), Children’s Corner Suite by Claude Debussy (piano) and the Nocturne in C sharp minor No. 20 Op. Posth. by Fryderyk Chopin (piano). Many disagree with the whole ethos behind competitions, but I feel every performer will have really benefitted from playing in this relaxed setting (irrespective of whether they won their class or not), and we hope they continue to enjoy these events, honing their playing and performing skills. A cohort of winners performed at the Gala concert and prizegiving ceremony held yesterday evening (at the Rudolf Steiner Theatre, in London). I wish Musica Nova continued success with the Stars of the Albion and I look forward to next year’s competition.